Navigation: Home » Personal Finance » How Many Mortgages Do You Purchase in a Lifetime? In a recent post, I lamented the inefficiencies I saw in the mortgage process. Red tape, confusing questions, obscured data and dragging one’s feet is all-too-common in the loan origination business. My main question I sought to answer today is ‘Why?’ With a purchase so large and significant, I would hope that the market provided a better answer, but, alas, here we are. I can best compare my struggles with this question with my experiences when I go to McDonald’s or any restaurant for that matter. I can pull up to the drive-thru, order my #9, pay the cashier and then within moments I have a servicable, predictable if not bland but dependable sandwich for the exact price that was promised to me. I enjoy the dependability and consistency, if not the incredible service and amazing turnaround time. The aspect of this transaction that fascinates me the most is that this is common in the industry. Everybody has a horror story of going to a restaurant and being made to wait 45 minutes (GASP!). It reminds me of Louis CK’s bit on waiting on the runway. 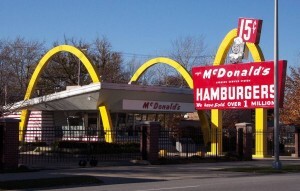 Sidenote: think innovation is done in fast food process excellence? I for one think this is a fantastic idea, leading to specialization, cost-savings and order accuracy, but if you disagree, let me know in the comments: McDonald’s is outsourcing its drive-thru operators! The best explanation I could come up with is the sheer volume of transactions you partake in a lifetime. Because I didn’t bother to research, I will estimate that the average American eats at a restaurant two times a month. This may be high or low, I don’t care. That means in a ten-year span, your average person visits 240 restaurants. This includes aurport restaurants, visiting different cities, ordering in, all the different options you have that you are able to sample. After a while, everybody develops their own preferences for what types of food and what types of service they like. When I am at a restaurant and I order coffee I take careful note of my cream/sugar ratio (for those who call me a Yankee, I don’t care). If I am halfway through the cup and the waiter fills it right to the top, the entire balance is thrown out of whack and I have a lesser experience. It does not ruin the experience, but it certainly irks me a little. Compare that anecdote with a mortgage. Do you think I would be able to even begin to explain the slight nuances in process that I prefer when it comes to originating a mortgage? The whole concept is extremely foreign to the average American so slight improvements or innovations are largely unseen or unrecognized. This also means that there is little incentive to innovate. If your average citizen will put up with an ordeal of a process because there’s no other option then why not just continue business as usual? Especially if it’s profitable and it’s expensive and risky to innovate. This led me to think of how many mortgages I will originate in a lifetime. Will I be able to distinguish between better and worse customer service? Will I be able to distinguish among the best and worst companies? I put my number around 8 for a lifetime. This will include moving, rental properties, refinances, etc. It may be a little high, but I am willing and able to hop around the country or world so I thought I might hedge toward the high end of the number. How about yourself? How many mortgages have you originated in your lifetime? How many do you expect to? What parts of the process do you find most irritating? Was there any innovation you have seen recently that was refreshing? I have owned one property for 6 years and have already had 3 different mortgages. I would envisage that in my lifetime, the number will easily be in double figures given rental properties etc. Maybe 20-30. It therefore upsets me greatly that the process is not as easy as ordering a Macdonalds!! However, I suppose in such a monumental transaction, the banks need to ensure that they are certain that the lending is safe & profitable (although even with the mammoth amount of forms they use and loops to jump through, they still don’t do a very good job)!! I could see myself in the 20+ range but it all depends on interest rate environment as well as my own eventual diversification plan. For example, having three mortgages on the same house is much more common in a falling interest rate environment than a rising. I would expect your future number of mortgages to be more dependent on available capital to purchase more houses. Lisa: No, dad, it’s a rhetorical question. So you’re saying McDonalds should start doing mortgages? McDonalds does really do some very innovative stuff as does the entire fast food industry. The industry order accuracy rate is actually quite impressive too. Counting refinancing I’m on my 5th mortgage. (plus one aborted attempt with a probably crooked broker) If I’ve counted right and not forgotten any. I’m not sure if I’ll get many more in my life… maybe 1-3 more. I have no clue. I probably won’t refinance the ones I’ve got as I can’t really imagine interest getting too much lower. I honestly haven’t had a lot of problems with my mortgages past the first aborted one. Most of them have been through the same broker who does a pretty good job. Unfortunately I think its probably just a fact of life that the complexity of a transaction is proportional to the amount of money at stake. Agreed. Add in a lot of third party risk when you have to entail Fannie Mae, FHS, the mortgage originator, the mortgage servicer, the appraiser and the various banks that are involved in the process and you can see why things like ‘Title Insurance’ and ‘escrow’ still exist in a digital age. Part of me feels like they are a relic of a bygone era while another part feels that they are necessary in such a significant purchase with a large sum of money changing hands. I think its a little of both. There ought to be a lot of checks and regulations for something as major as a home loan. But the system we have now is a lot less efficient then it could be. I have had 3 mortgages for homes including my current one. I expect to have no more although I will make one last move to a single story home. I had 7 mortgages on income property.